Beloved Yankee, the first African-American player to wear Yankee pinstripes and a great player in his own right. Elston played for the Yankees from 1955-1966 and was a key player on many of their top teams, including the 1961 Yankees. As if that was not enough, Elston was also a 1967 Red Sox team member! Elston sadly died in 1980 at only age 51. As with so many other players, he is truly rare on a single signed baseball. Needed by almost all 1961 Yankee and 1967 Red Sox collectors, these are a really big deal when they come to market. 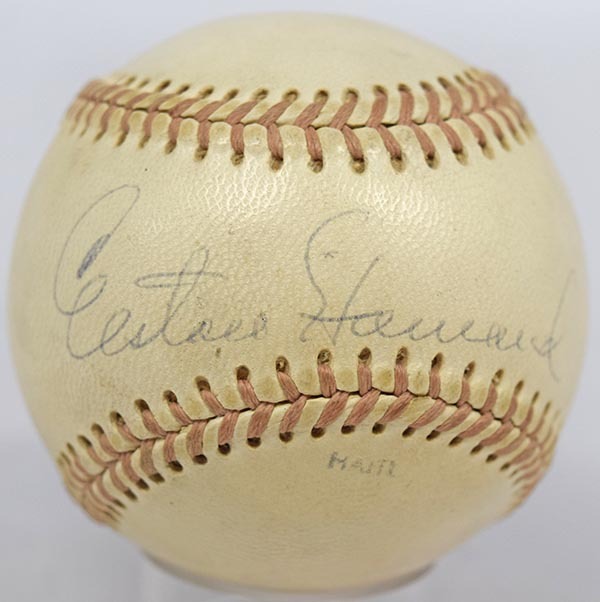 The offered ball is signed on a scarce Official National Baseball Congress model baseball, likely in the 1970s. The ball itself is off-white and clean. Elston signed the sweet spot, this is a particularly large and fine signature, with a great flow. Who wants to fill one of the ultimate spots in a Yankee single signed ball collection? JSA LOA (full).